Above: On Thursday 19th April 1962 class A1 No. 60141 Abbotsford of Copley Hill (Leeds) shed pulls away northbound past the vantage point of Grantham North signal box. Colin Walker was born in Leicester on 3rd November 1930. After studying at the Bath Academy of Art he returned to his home city as Head of Art at Mundella Boys' School. In the late 1960s his career took him to Bicester School in Oxfordshire. He also lectured for Warwick University, training a new generation of art teachers, before finally retiring to North Wales. Colin was a master of the medium of black and white photography, combining dramatic viewpoints with a keenly observed sense of the interplay of light and shade, shape and composition to create emotive views of the steam railway. Above all, his photographs exemplify the art of creating 'mood' in a monochrome image. Many of Colin Walker's photographs have been published in the railway press and on the sleeves of 'Argo Transacord' steam recordings made by Peter Handford. 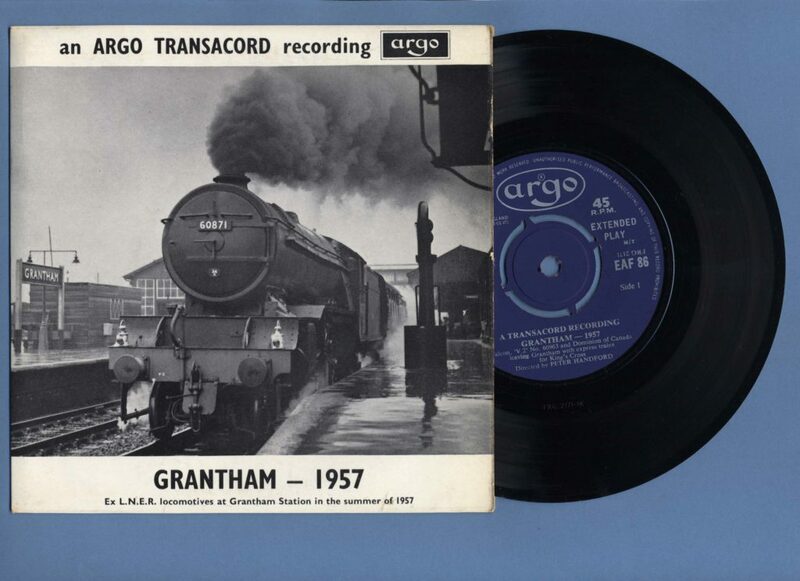 One of Colin Walker's atmospheric photographs aptly illustrates the sleeve of this 7-inch EP (Extended Play) disc of evocative sounds of the steam railway recorded by Peter Handford at Grantham. One of his most evocative works is Main Line Lament of 1973, a moving tribute in pictures and words to the men and traditions of the Great Central main line between Sheffield and London. It was published following the route's run-down and closure in the 1950s and 1960s and the author remarks, in his poignant introduction, 'This has been a sad book to prepare.' 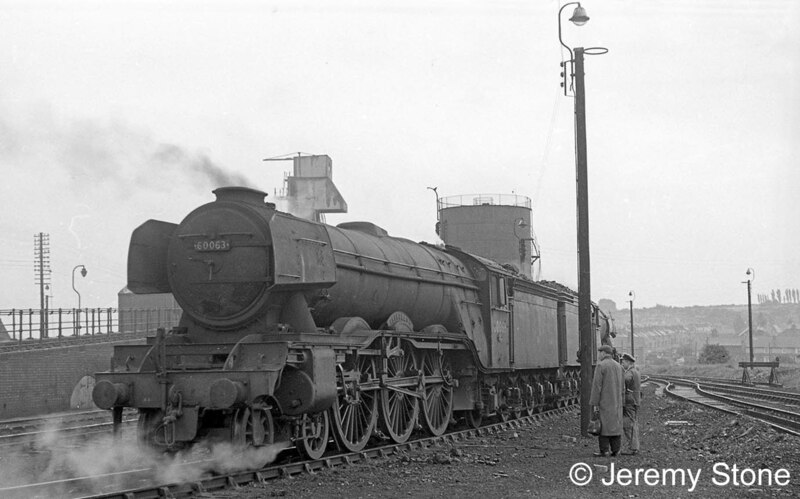 Several of the A3 locomotives he photographed on trains such as The Master Cutler were transfered to Grantham when express services were withdrawn from the GC section. Colin was the Vice President of the Great Central Railway Society. Colin Walker's work has featured in two public exhibitions. The first was Tribute to Steam, featuring 145 prints, which opened at Leicester's civic Museum & Art Gallery at New Walk in 1967. Later in the year the exhibition toured to Grantham, where it could be seen at the Public Library and Museum between 4th and 30th December. Grantham shed on Saturday 7th September 1963, its final day of activity. A3s No. 60063 Isinglass and 60112 St. Simon are standing as main line pilots for the last time. Photographer Colin Walker has travelled over from Leicester to record the occasion and is seen chatting to one of the locomotive crew. Steam World No. 227 (May 2006) 'Platform': Thanks for the Memories - tributes to Colin Walker from his son, Martin, and John Massey. What a useful interesting site. I found it whilst searching for Colin Walker as I have a catalogue of his exhibition in 1967 I wanted to sell on Gumtree! I grew up almost opposite the yard on Springfield Road in Grantham, my grandfather worked on the railways - Thomas Harry Gutteridge, b1897. I've just been reading one of Colin's books (Great Central Twilight Finale) and had a lovely surprise, a reference to my Dad, Bert Naylor, who was head passenger shunter on Leicester Central. I remember watching my Dad (Noz, as he was known) doing his job many times and I don't mind telling you it frightened me to to death. It's brought a few tears to my eyes and many happy memories. Thank you for your comment. I grew up in Leicester and have always admired the Great Central - some of my earliest spotting memories are when Mum took my sister and me to St Margaret's Pasture and we watched the trains rattle across the river on that huge girder bridge which was there. Unfortunately the rundown of the GC was already happening by then; I never saw the A3s, and only an occasional V2. I agree with you that Colin's photographs and his books are masterpieces - there's real affection and emotion in his pictures and in his words. He had a genuine connection with railwaymen too - as you've discovered, finding the mention of your Dad. 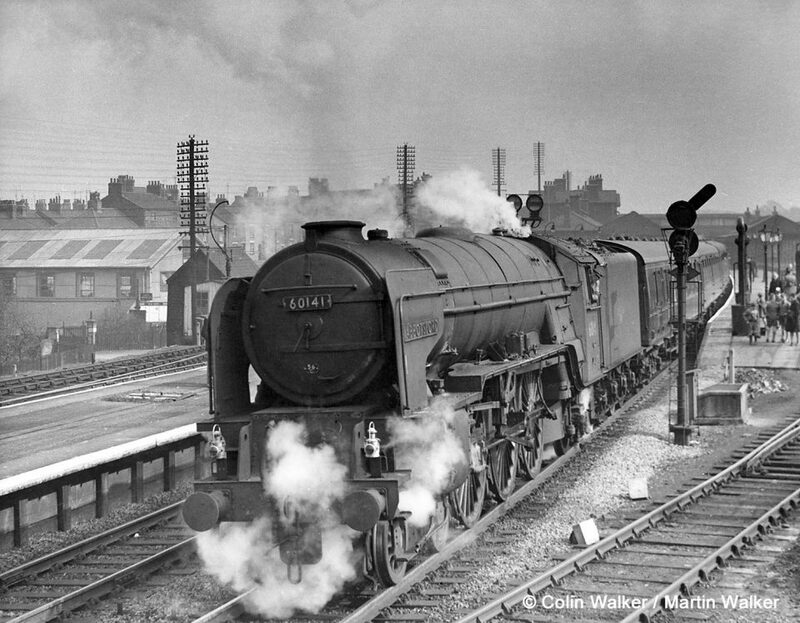 Lovely tributes to Colin Walker, whose black and white images of the the Great Central railway are truly masterpieces of the art of photography. The twilight years of the line were captured superbly by him and evoke so many happy memories for me and, I suspect, many others. Thank you Colin RIP.